Elk Tracker Elk live in America's toughest habitat and require maximum effort from those who hunt them. Our Elk Tracker series is built just for such a hunter, with a Bulls-Eye® Air Bob Aggressive sole for excellent traction and a lightweight, shock-absorbing comfort cork midsole. The waterproof, full-grain leather uppers offer support and durability. 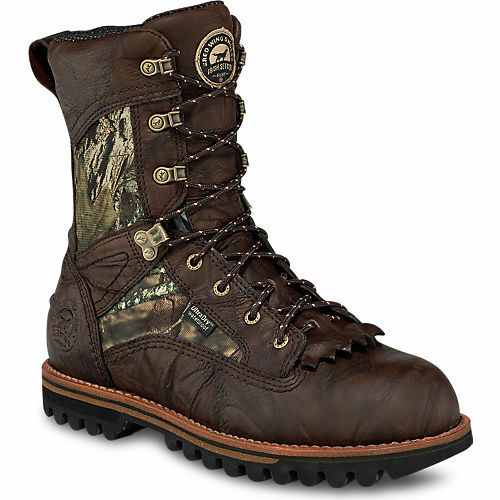 The Elk Tracker 886 features these technologies: UltraDry™ Waterproofing System Our UltraDry™ construction combines a moisture management lining with waterproof components for dry, long-lasting comfort and performance. ScentBan™ An Irish Setter exclusive scent control process, ScentBan™ is added to various materials from leathers to linings to footbeds, killing bacteria that cause odors. PrimaLoft® Gold Designed for repeated compression and durability over time. Featuring 90% post-consumer recycled fibers made from plastic bottles, this unique low-bulk construction maintains loft and traps body heat even when compressed. Coupled with a permanent water repellent treatment with high-density construction, this insulation keeps feet warm in dry or wet conditions. Mossy Oak® Mossy Oak® Break-Up Country® uses dramatically larger limbs, leaves, bark, branches and other digitally enhanced elements to fuse hunters with their terrain. Mossy Oak® Break-Up® camouflage features unprecedented depth, unequalled detail and elements with remarkable contrast, offering hunters another dimension in camo. Mossy Oak® Break-Up Infinity® is a versatile pattern used effectively in various hunting situations from flooded timber to deep woods. Includes elements like bark, branches and leaves to mimic actual colors found in nature.